The Pygmy Owl and the Snowy Owl are the same because they both look like they have masks on their faces. The Pygmy Owl and the Snowy Owl are different because the Pygmy Owl is little and the Snowy Owl is big. The Great Horned Owl and the Barn Owl are the same because they both eat rats. They are different because the Great Horned Owl can be 25 inches tall and the Barn Owl is only the size of a chicken. 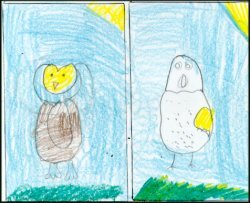 by Ryan E. The Barn Owl and the Snowy Owl are the same because they don't have tufts. 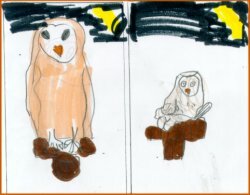 The Barn Owl and the Snowy Owl are different because they live in different places. The Barn Owl and the Pygmy Owl are the same because they are both small. 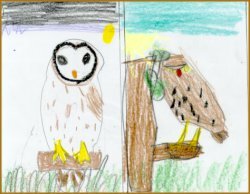 They are different because the Barn Owl has a heart shaped face and the PygmyOwl does not. The Snowy Owl and the Barn Owl are the same because they both have sharp beaks. The Snowy Owl and the Barn Owl are different because the Snowy Owl can be 25 inches tall and the Barn Owl is about the size of a chicken. 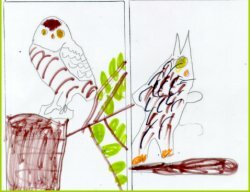 by Celia M. The Great Horned Owl and the Snowy Owl are the same becuase they both have talons. They are different because the Snowy Owl is white in the winter and the Great Horned Owl is not. The Great Horned Owl and the Snowy Owl are the same because they both can grow to be 25 inches tall. The Great Horned Owl and the Snowy Owl are different because the Snowy Owl is white in the winter and the Great Horned Owl isn't. The Burrowing Owl and the Pygmy Owl are the same because they both eat insects. The Burrowing Owl and the Pygmy Owl are different because they have different color feathers. by Joseph Ba. The Snowy Owl and the Great Horned Owl are the same because they can both grow to be 25 inches tall. 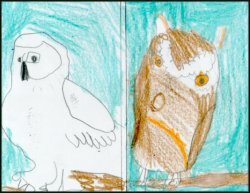 They are different because the Snowy Owl lives in cold places and the Great Horned Owl does not. The Snowy Owl and the Barn Owl are the same because they both eat rats. 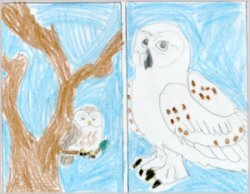 They are different because the Snowy Owl lives in the Artic region and the Barn Owl lives in grassy plains. 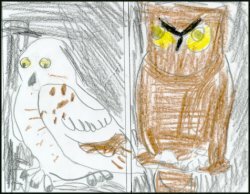 The Great Horned Owl and the Pygmy Owl are the same because they both have wings. They are different because the Great Horned Owl can grow to be 25 inches and the Pygmy Owl can only grow to be 6 inches. by Michael G. The Pygmy Owl and the Snowy Owl are both the same because they both fly. The Pygmy Owl and the Snowy Owl can grow to be 25 inches tall and the Pygmy Owl can grow to be only 6 inches tall. The Snowy Owl and the Great Horned Owl are the same because they are both big. 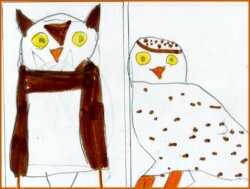 They are different because the Great Horned Owl has large tufts and the Snowy Owl does not. The Burrowing Owl and the Barn Owl are the same because they both have feathers. 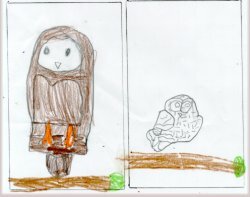 The Burrowing Owl and the Barn Owl are different because the Barn Owl has a heart-shaped face and the Burrowing Owl does not. The Burrowing Owl and the Long-Eared Owl are the same because they both eat frogs. The Burrowing Owl and the Long-Eared Owl are different because the Burrowing Owl can be 9 inches tall and the Long-Eared Owl can be 14 inches tall. The Snowy Owl and the Great Horned Owl are the same because they can both grow to be 25 inches tall. They are different because the Snowy Owl has thick pads and thick feathers on it's feet and the Great Horned Owl does not. The Barn Owl and the Pygmy Owl are the same because they both sometimes hunt in the daytime. The Barn Owl and the Pygmy Owl are different because the Barn Owl has heart-shaped face and the Pygmy Owl does not. The Snowy Owl and the Great Horned Owl are the same because they both have sharp beaks. The Snowy Owl and the Great Horned Owl are different because the Snowy Owl is white in the winter and the Great Horned Owl is not. We hope you enjoyed our book!